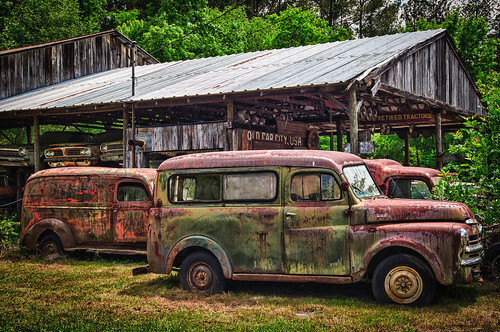 About 45 miles northwest of Atlanta, in White, Georgia, is a photographer’s paradise known at Old Car City. Old Car City started as a small country store in 1931 and has been in the same family ever since. Owner Dean’s father started selling cars in the lot next to his general store and today the site has grown to 34 acres with over 4,000 cars. 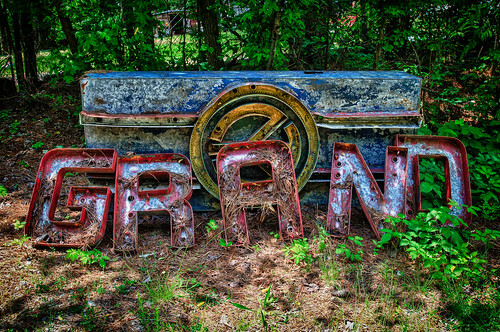 They no longer sell parts — it’s more of a living museum, with over 6.5 miles of trails. I visited Old Car City for the first time back in November 2010, and it’s probably because of this visit that I became so fascinated with HDR (high dynamic range) photography. 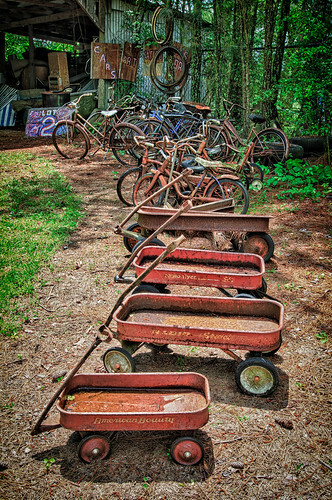 HDR is a perfect canvas for conveying all the rust and grit this place has to offer. On that visit, I shot lots of cars and trucks — *lots and lots* of cars and trucks. I visited again this past Friday, and even though we had access to even more of the place than the first time, I found myself fixated on just about everything other than cars and trucks. The photos below is probably one of my favorites from the day! 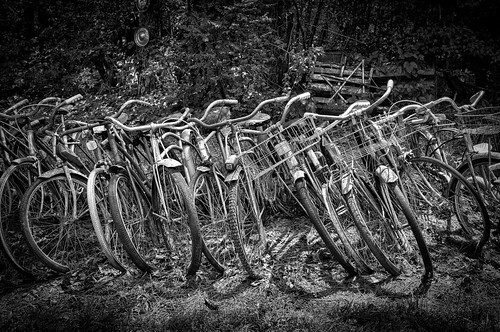 The bikes were really colorful, but after processing the photos, I realized that the key element of this shot wasn’t the color, but the structure of bicycles lined up in a row. Nothing shows off structure like black & white, and when I converted it, I was in love. 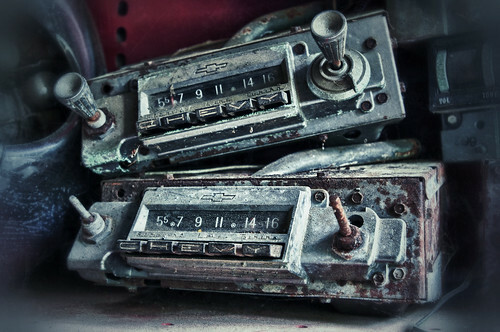 In my next post, I’ll share some of the cars and trucks that I shot, but I’ll wrap up this post with a shot of some radios on a shelf in the main building on the grounds. Most of the texture and feel of this one are compliments of Snapseed by Nik Software (I *heart* Nik products!). Please check out my Old Car City set on Flickr for more photos from this set, as well as shots from my first visit back in 2010.